Narkel Naru is a dessert from Bengal. They are ball-shaped and made from khoya/condensed milk and coconut, a traditional food during Pujas such as the Durga Puja/Lakshmi Puja, consumed throughout India. Today I'm going to share the recipe of another version of Narkel Naru, which is made with scraped coconut & date palm jaggery. This "Narus" are served specially during "Lakshmi Puja". Tomorrow is Laksmi Puja. So this coconut laddus will be made in every Bengali houses. Here is the recipe. "Chinir Narkel Naru" amd "Gurer Narkel Naru" are two different types. And their preperation and quentities are also different. "Gurer Naru" is little difficult to make. 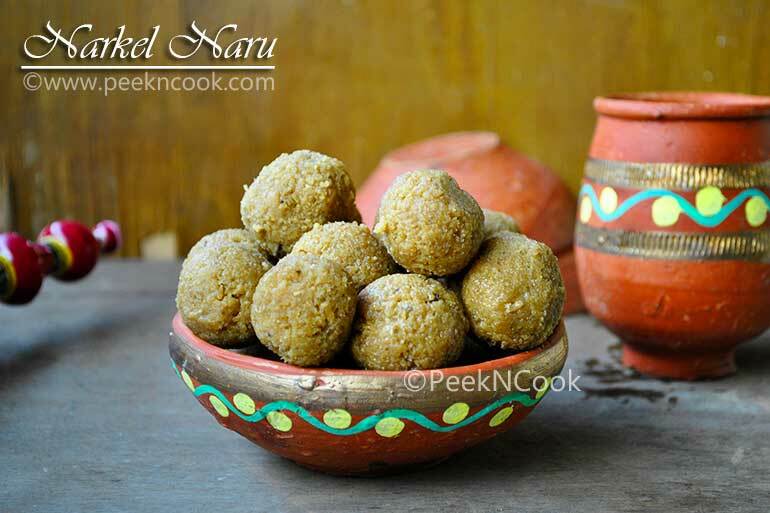 Today I'm going to share the recipe of another version of Narkel Naru, which is made with scraped coconut & date palm jaggery. This "Narus" are served specially during "Lakshmi Puja". Take a non-stick pan, add the scraped coconut, gur, sugar all together and mix all the ingredients using your hand. Now place the pan on low heat. Give it a stir to check that it is not burning. Cook this on low flame so that you will know that it is slowly forming a mass. If you want to make it sticky and love the deep brownish hue then add two to three tablespoon jaggery more. Adjust the quantity of jaggery as per your taste. Keep on cooking it on low flame till all the jaggery melts and is well incorporated into the coconut. When the mixture will look like little sticky, add the khoya and mix with it. Now turn off the heat when you think that it is forming small lumps.Remove the mixture immediately from the non-stick pan and spread it out on a plate. Take 2 tablespoons of coconut mix and roll into a ball. The Naru has to be formed while the mix is still warm, almost hot. It will harden when it cools and you will not be able to give it shape. Make the rest of the Naru and let them cool down completely. Your "Gurer Naru" is ready to serve.